Frank Garbas was born in July 1922 in Hamilton, Ontario, Canada, one of nine children. Many of the families who had come to the town, attracted by the prospect of work in the steel mills, were like his of Polish descent. He attended the town’s Cathedral High School and Technical Institute where he was good at sports, and went on to play rugby in the local Eastwood team with Albert Garshowitz. He also played in another team which became Canadian champions. After leaving school he worked for Otis Elevators, but joined the RCAF soon after the outbreak of war. After training in Canada and qualifying as a wireless operator/air gunner he was shipped over to England in the summer of 1942, and went to the gunnery school at RAF Stormy Down, where one of his instructors was John (‘Tommy’) Thompson about whom I blogged last year. After completing training, the crew was posted to 9 Squadron at RAF Scampton just before Christmas. Sadly, early in the New Year, Max Stephenson flew as the flight engineer on an operation to Duisberg with another crew, and was shot down. 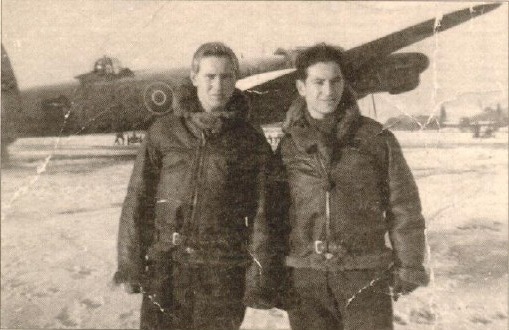 So, without a pilot, the crew was posted to 57 Squadron, where they were allocated to Bill Astell. In another letter home, dated 28 January 1943, Garshowitz described Astell as a ‘veteran at the trade’ and ‘an experienced and gen pilot’. He went on to describe how Garbas had only just had his first shave and ‘tore his whole side of the face – laughs galore’. It’s a sobering reminder that he would in fact die before his 21st birthday. The new Astell crew flew on their first operation in 57 Squadron on 13 February 1943, and had completed a number more before being transferred to 617 Squadron on 25 March. Less than two months later they would die, damaged by flak and colliding with a pylon near Marbeck. They were buried in Borken. After the war, Frank Garbas and his comrades were reinterred together in Reichswald Forest Commonwealth War Graves Cemetery. The friendship between Frank Garbas and Albert Garshowitz is mirrored in a later generation by that of their nephews, Paul Morley and Hartley Garshowitz. Together they have done much to keep the memory of their uncles alive, and I am privileged to know them both. Many thanks to them for help with these articles about the Astell crew. was Garbas Jewish as well? … then there would have been at least two Jewish Dambusters! No, Garbas’s family was Polish-Canadian Catholic. However, there was another Jewish Dambuster – Jack Guterman, wireless operator in Ottley’s aircraft, AJ-C.
Charles, I suspect that when Garshowitz refers to them playing football, he means the American variety, not rugby! Frank was born on 13th July 1922.